In the old days, buying good quality new Land Rover parts was the sole domain of the Land Rover main dealer only. If you needed any new Land Rover spares then this is where the vast majority of Land Rover drivers would go to. Seems sensible, as if you had such a nice vehicle why would you go anywhere else? Well……because of the cost for a start. And that simple fact added to top class customer service is what has been bringing the Land Rover drivers of Essex to our premises time and time again, for the last 30 years. At Pound Lane Auto Discounts or Car Spares Essex as we are known online, we can supply the vast majority of new parts, spares and Land Rover accessories at a fraction of the cost of the main dealers. And that goes for the full range of Land Rover spares for four wheel drive vehicles too. The Discovery, Defender, Range River, Range River Sport and even the latest Range Rover Evoque all have spares waiting on our shelves. From water pumps, to suspension parts. From oil, air and fuel filters, lubricants, flushes and fluids to brake parts, and accessories we are just a phone call away on 01268 728309. But Surely It's Easier To Just Go To The Land Rover Main Dealers For My Parts? Buying your new Land Rover parts at Pound Lane Auto Discounts in Basildon, will not only give you a different option, but also will make your life so much easier. Being a family owned business we know that we are only as good as our last customer. We want to provide you with the old style customer service that your Grand-Dad would have considered as normal. So it won’t matter to us if you only want a nut and bolt, or you want Land Rover parts and spares such as clutch kits, or exhausts. We will do our best to provide what you want, as easily as we can. The reason for this, is we know that you may not be our customer the first time you contact us, or the second, but somewhere down the line you will give us a go. So in the meantime if we don’t have the part at the time of your calling, then we can do some phoning on your behalf and see if we can get it for you. We are not going to be 100% successful all the time, but there is certainly a good chance that we will come up trumps if you give us a try. If You Haven’t Got My Land Rover Spares Then How Long Will It Take To Get Them? Sometimes when you contact us, we may have just sold the Land Rover parts that you are looking for. Well don’t despair, as being the Essex motor factors of choice for over 30 years means that we have developed a huge network of Land Rover contacts, and suppliers. Our suppliers can most times get the parts for your Land Rover within a couple of hours, or at the latest for next day delivery. For most people this is far more convenient than traipsing around the streets of Essex and the South East trying to locate the item themselves. So as we advise most of our customers the best thing to do is contact us on our easy to complete order form, and we can see what we can get in, and at what price too. Do You Sell Genuine Land Rover Car Parts Too? No, all our parts are pattern parts, but we can assure you that they are the best possible quality we can provide. We have two things that we try to be sure of. Great quality products at the lowest prices that we can possibly offer. The last thing we would want is for you to be unhappy at the Land Rover spares that you buy from us. If you do want genuine Land Rover parts, then we can buy them in for you from the main dealers, although of course the price will be considerably higher. So at the bottom of the page is a guide to the parts and spares that we can get for your Land Rover. And honestly, even if it doesn't have your bit on the list below still give us a call, or even better pop in to see us. We still want to see if we can supply the item that you are searching for. Most of the time, we will be able to do this within a couple of hours, or we can tell you on the phone that it's out of our network of motor factors we use and its not something that we can provide. Would You Consider Delivering The Land Rover Parts That I Have Bought From You? Unfortunately as we are just a small family business, we do not have the capability to deliver parts. Our incoming trade, and dealing with the phone and email queries. So not to distract from the things that we do very well, we will not be offering a delivery service but can make it easy for you, by ordering the part that you require ready for your collection. Contact us on 01268 728309 or by using or contact details. 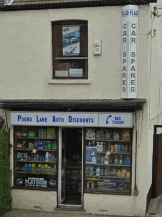 Ok, You Have Convinced Me Where Do I Find Car Spares Essex? We are very fortunate to be positioned between all three of the main routes across the county of Essex. So it doesn't matter if you are up in the north of the county, or nearby, you can jump on the A127, A13 and A130 and be with us to collect your Land Rover parts in no time at all. And even better, to speed your journey home get us to order them before you arrive to make sure that your journey is not wasted. So to find out how easy it is to get to Car Spares Essex, otherwise known as Pound Lane Auto Discounts then use the link below the image, and enter your home postcode for step by step instructions.